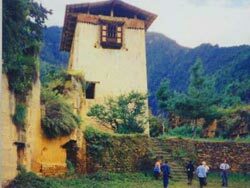 Mystery surrounds Bhutan's distant past, as many priceless documents were irretrievably lost in fires and earthquakes. In the 8th century CE, Guru Padma Sambhava made his legendary trip from Tibet to Bhutan on the back of a flying tigress. He meditated at Taktsang, Tiger's Nest, in the Paro Valley. Guru Rinpoche (Precious Master) is the father of the Tantric strain of Mahayana Buddhism practiced in Bhutan. Shabdrung Ngawang Namgyal, a Tibetan lama of the Drukpa School, arrived in Bhutan in 1616. He introduced the present dual system of religious and secular government. Shabdrung unified the country, and established himself as the country's supreme leader and vested civil power in a high officer known as the Druk Desi. Religious affairs were charged to another leader, the Je Khenpo. For two centuries following Shabdrung's demise, civil wars intermittently broke out, and the regional penlops (governors) became increasingly more powerful. This ended when an assembly of representatives of the monastic community, civil servants and the people, elected the Penlop of Trongsa, Ugen Wangchuck, the First King of Bhutan in 1907. The monarchy has thrived ever since, and the present Fourth King, His Majesty Jigme Singye Wangchuck, commands the overwhelming support of his people. The Kingdom of Bhutan lies in the eastern Himalayas, between Tibet to the north and the Indian territories of Assam and West Bengal to the south. The Kingdom has a total area of about 47,000 square kilometres. Located in the heart of the high Himalayan mountain range, Bhutan is a land-locked country surrounded by mountains. The sparsely populated Greater Himalayas, bounded to the north by the Tibetan plateau, reach heights of over 7,300 meters, and extend southward losing height, to form the fertile valleys of the Lesser Himalayas divided by the Wang, Sunkosh, Trongsa and Manas Rivers. Monsoon influences promote dense forestation in this region and alpine growth at higher altitudes. The cultivated Central uplands and Himalayan foothills support the majority of the population. In the south, the Daur Plain drops sharply away from the Himalayas into the large tracts of semi-tropical forest, savannah grassland and bamboo jungle. Bhutan's climate ranges from tropical in the south, to temperate in the centre of the country, to cold in the north...and can be quite unpredictable. The weather can vary dramatically from place to place and equally dramatically from day to day or even within the same day. 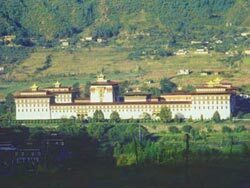 In the Thimphu and Paro valleys, winter daytime temperatures average 60 degrees Fahrenheit during clear winter days but drop well below freezing during the night. Mid December to early January can be a beautifully clear and dry time in Western Bhutan. The fluctuations are not quite so great during the summer and daytime temperature often rises to the mid-eighties in Fahrenheit. Punakha and the central valleys are lower than their Western neighbors and tend to always be a few degrees warmer. The higher peaks are snow-covered all year. The higher passes, particularly Thrumsing La between Bumthang and Mongar, can be treacherous during the winter as snow falls frequently and ices up the road. Light snow will often dust Thimphu and Paro in winter but infrequently there are heavy snowstorms despite their location in the Central Himalayas. The Summer monsoon from the Bay of Bengal affects Bhutan from late May to early October. Views over the Himalayas from the higher passes are usually obscured from May to August. There are notable advantages to visiting Bhutan during the wet season including the spectacular rhododendron blossom from March through May and the deep green valleys. The Spring season in Bhutan can be compared to a master artist's palette with colours that, until now, have only existed in the imagination. Truly a spectacular time, the Autumn season, October through November, is usually very mild and clear and the Fall colours surround and embrace your senses. Bhutan's official language is Dzongkha. Given the geographic isolation of many of Bhutan's highland villages, it is not suprising that a number of different dialects have survived. Bhutan has never had a rigid class system. Social and educational opportunities are not affected by rank or by birth. Bhutanese women enjoy equal rights with men in every respect. Bhutanese men wear a gho, a long robe tied around the waist by a small belt called kera. The women's ankle length dress is called a kira, made from beautifully colored and finely woven fabrics with traditional patterns. Necklaces are fashioned from corals, pearls, turquoise, and the precious agate eye stones which the Bhutanese call 'tears of the gods'. While urban settlements have sprung up with the process of modernization, the majority of Bhutanese people still live in small rural villages. The Bhutanese diet is rich in meat, dairy, grain (particularly rice) and vegetables. Emadatse (chili and cheese stew) is considered the national dish with many interpretations to this recipe throughout the country. Meat dishes, mainly pork, beef and yak, are lavishly spiced with chillies, and it is common to see bright red peppers drying on rooftops in the sun. Salted butter tea, or suja, is served on all social occasions. Chang, a local beer, and ara, a spirit distilled from rice, maize, wheat or barley, are also common and widely favoured. Doma or betel nut, is offered as a customary gesture of greeting. 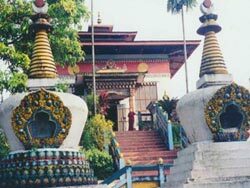 The Bhutanese way of life is greatly influenced by religion. People circumambulating the chortens with prayer beads and twirling prayer wheels are a common sight. Every Bhutanese home has a special room used for prayers, a chosum. Bhutan is the only country in the world to retain the Tantric form of Mahayana Buddhism as its official religion. The Buddhist faith has played and continues to play a fundamental role in the cultural, ethical and sociological development of Bhutan and its people. It permeates all strands of secular life, bringing with it a reverence for the land and its well being. Annual festivals (tsechus and dromches) are spiritual occasions in each district. They bring together the population and are dedicated to the Guru Rinpoche or other deities. Throughout Bhutan, stupas and chortens line the roadside commemorating places where Guru Rinpoche or another high Lama may have stopped to meditate. Prayer flags dot the hills, fluttering in the wind. They allow Bhutanese people to maintain constant communication with the heavens.